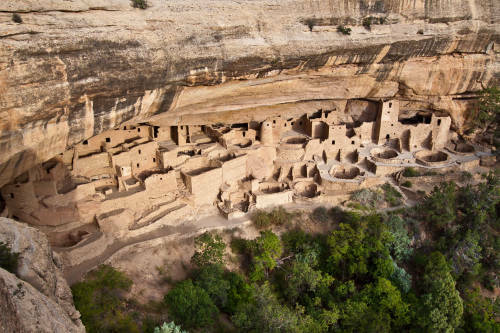 Its ruins of homes and villages are said to be among the best-preserved cliff dwellings in the world. The 81.4 square miles of the national park was once home to the Ancestral Puebloans who inhabited Mesa Verde between 600 and 1300. More than 600 cliff dwellings and 4,000 archaeological sites have been found at the park. A visit to Mesa Verde National Park offers a fascinating look into ancient human life. The national park is named Mesa Verde, which is Spanish for “green table,” due to the lands where ancient peoples grew crops, primarily corn, and hunted for meat. Visitors can enjoy these beautiful mesas as well as experience the fascinating ruins of the people who lived there many years ago. One notable structure is the Balcony House, a Pueblo ruin with 45 rooms and 2 kivas, or rooms designated for religious rituals. Visitors enter by climbing a 32-foot ladder and crawling through a 12-foot tunnel. Other ancient ruins of interest include multi-storied ruins, villages, reservoirs, and towers. Bring your family or friends to a place like no other in the world...Mesa Verde National Park in southwestern Colorado. Hotels inside Mesa Verde are rare, but staying inside the park at the Far View Lodge gives you the best experience and places you right in the middle of all the action and attractions.